Celtic astrology signs and symbols developed long before what we know of as modern astrology began. 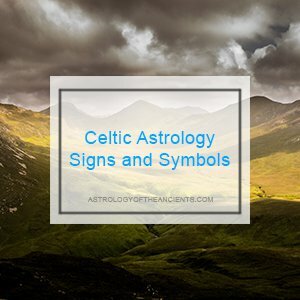 So while you might be familiar with zodiac signs like Aquarius and Taurus, Celtic astrology is a much older system for assigning meaning to life. Beginning over 3,000 years ago, Celtic beliefs were based in nature. They didn't look just at the stars in the sky for astrology signs and symbols, they looked at the very world around them – the trees that gave them food and shelter, and the animals that were their guides and companions. The ancients Celts saw each tree as having particularly qualities, such as the flexibility of the willow and the strength of the oak. They observed how each tree changed with the seasons. They noticed the qualities and characteristics of the trees matched the personalities of people born during certain times of the year. It is from these observations that Celtic Tree Astrology and its corresponding signs and symbols began. But the Celts didn't look at just trees. They also noticed that animals have certain qualities and characteristics. Animals became signs and symbols with different meanings attached to each one. When Celts saw a hawk, they interpreted it as a sign to beware and to be aware, whereas a fox could be a sign to be cunning and wise. Over time, animals also became Celtic astrology signs and symbols – providing different insights about life and acting as a person's astrology sign based on when they were born. It is from these observations of nature that the foundation of Celtic astrology signs and symbols began. By honoring how all of life is interconnected, the Celts based their astrology meanings on how nature influences life and people. For them, it isn't about people being superior to or having power over nature. But rather, it is about how people connect to nature. In many ways, the role that nature plays in Celtic astrology signs and symbols mirrors the role nature plays in Native American beliefs and traditions. Both look at how a person's actions, thoughts and beliefs affect nature, and how nature similarly affects people. So the next time you're outside, look around as see what Celtic astrology signs and symbols you might be seeing. No need to wait for the night sky!